Vintage from Paul is pleased to offer this Mayer China Restaurant Ware Horn Hardart Marion Cup. Old records from the Syracuse China company have confirmed that the Marion pattern was a “controlled” pattern for Horn & Hardart automats and bakeries. In addition, the archivist with Syracuse China confirmed that Syracuse made the pattern and that it was controlled across all territories. This would mean that no company other than Horn & Hardart would be allowed to use the pattern ...no matter the who the china manufacturer may be. 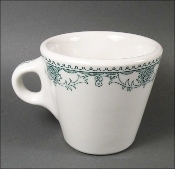 The Mayer China Restaurant Ware Horn Hardart Marion Cup stands 3-1/4 inches in height and measures, 4-1/2 inches from rim to handle. The Mayer China Restaurant Ware Horn Hardart Marion Cupis in Mint condition with no chips, cracks or discoloration. The graphics are crisp, the colors vibrant. The Mayer China Restaurant Ware Horn Hardart Marion Cup is marked with "Mayer China, Est. 1881, Kirkwood pattern".